ly's food with him, and he was very much an epicure—he absolutely loved to host parties," explains Carolyn Phillips, author of the James Beard-nominated cookbook All Under Heaven: Recipes from the 35 Cuisines of China. Together with his house cook, Phillips says, this government gourmand developed the 300 or so recipes that now form the basis of the school of cooking forever connected to his name. Typical ingredients of Tan cuisine include shark's fin, abalone, and sea cucum- ber—as well as swallow's nest, painstakingly cleaned then gently cooked in broth to create the perfect fusion of texture and taste. The repertoire even stretches to a recipe (never used these days) on preparing bear's paw; the instructions insist that only the left front paw is acceptable, since that alone is used to lick honey. 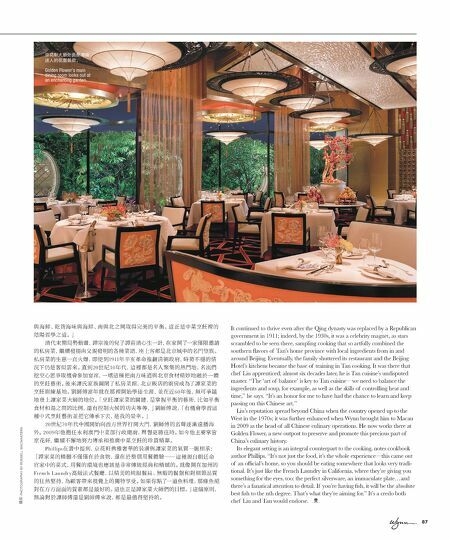 Phillips draws parallels between this culinary school in China and the finest French haute cuisine. "There's an emphasis on slow cooking, braising, steaming, poaching—any- thing that takes a long time," she says. "It's cooked so the natural flavors blossom, a perfect balance among sweet and savory, land and sea, chicken and seafood, dried and fresh, the north and the south. 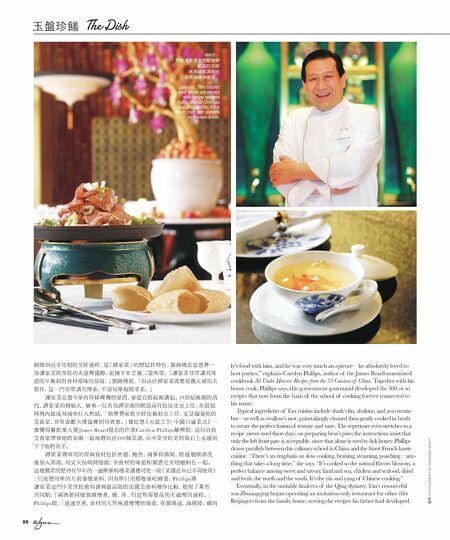 It's the yin and yang of Chinese cooking." Eventually, in the unstable final era of the Qing dynasty, Tan's resourceful son Zhuangqing began operating an invitation-only restaurant for other élite Beijingers from the family home, serving the recipes his father had developed. PHOTOGRAPHY BY BARBARA KRAFT 86 細緻到近乎苛刻的烹飪過程，是「譚家菜」的標誌性特色，劉師傅正是憑著一 身譚家菜的烹飪功夫蜚聲國際，更摘下米芝蓮二星殊榮。「譚家菜非常講究味 道的平衡和對食材原味的保留，」劉師傅說，「但由於譚家菜需要花費大量功夫 製作，是一門非常講究傳承、不容易掌握的菜系。」 譚家菜在當今享有珍稀聲譽的原因，要從它的起源講起。19世紀晚期的清 代，譚家菜的創始人，廣東一位名為譚宗浚的朝廷高官赴往北京上任，在短短 時間內就成為城中紅人熱話。「他帶著家族烹飪技藝赴京上任，又是個愛吃的 美食家，非常喜歡大排筵席招待賓客。」曾經憑《天堂之下：中國35道菜式》一 書獲得餐飲業大獎 James Beard提名的作者Carolyn Phillips解釋說，這位官員 美食家帶領他的家廚一起琢磨出近300個菜譜，在中菜烹飪史的基石上永遠刻 下了他的名字。 譚家菜裡常用的經典食材包括魚翅、鮑魚、海參和燕窩，經過細緻清洗 後加入高湯，用文火長時間慢煨，令食材的味道和質感完美地融和在一起。 這種嚴苛的堅持在早年的一道熊掌料理菜譜裡可見一斑（菜譜近年已不再使用） ：只准使用熊的左前掌做原料，因為熊只用那隻掌吃蜂蜜。Phil lips將 譚家菜這門中菜烹飪教科書與最高級的法國美食料理作比較，發現了某些 共同點：「兩者都同樣強調慢煮、燉、蒸、灼這些需要花功夫處理的過程。」 Phillips說，「通過烹煮，食材的天然味道慢慢地盛放，在甜與咸、海與陸、雞肉 順時針： 京城清真烤牛肉配燒餅 劉國柱大師 味道細膩清新的 茉莉海蚌清雞湯。 clockwise: Thin broiled beef slices are served with crispy sesame puffs; Master Chef Liu Guo Zhu; subtle, floral fresh clam and jasmine in chicken broth.